In the late 1970’s I was attending a radiology class during medical school. The esteemed Radiology Professor was the author of many textbooks of his profession and he was a proverbial “walking textbook” of knowledge about his field. He told us that 25% of the U.S. population suffered from the presence of a hiatal hernia. Fast forward to today; that number has exploded to approximately 60% of the middle-aged adult population in America. If you venture into the textbooks, not much is written about the causes of this dramatic explosion of an anatomic abnormality that predisposes many of us to all kinds of symptoms related to gastroesophageal reflux disease. This question has plagued my mind for several decades as I watched more and more of my patients developing this hernia. When I perform upper endoscopy on my patients, I see this 60% number approach 90% when I evaluate patients for gastroesophageal reflux disease. Granted, my patient population is a bit biased because of my referral base as a gastroenterologist. But, whatever the actual incidence of hiatal hernia in the U.S., it is very frequent and rising. I began searching for an answer to the rapid rise of this anatomic abnormality. Behold, the answer was found in the National Library of Medicine. It rests in the fact that we began consuming genetically modified wheat in the 1960’s onward as the crop yield increased from 20 to 200 bushels per acre. This led to the decreased cost and abundance of wheat-based products. We saw an explosion of pizza and pasta consumption like never before in American history. We now consume three billion pizzas annually and pasta consumption has paralleled this. Wheat contains a sugar known as amylopectin. This starch is distinctly different from the starch (amylose) found in potatoes and rice. When you boil the later, the starch falls apart and we end up with a mush. Contrary to this, the amylopectin of wheat expands like a fan before it becomes a mush. Think about boiling pasta on the stove. If you look at the noodles in the sink that escaped from the colander when draining off the water, they are about 3-5 bigger than the ones you consumed. 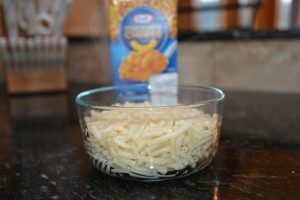 I performed a little experiment with some macaroni noodles just to show you the drama of this expansion. As the two photos reveal, I placed the noodles back in hot water for an additional ten minutes after cooking them for the prescribed nine minutes outlined on the box instructions. You can see that the noodles could not be contained in the same bowl. That same swelling occurs in our stomach after we eat the pizza, bread, pasta, etc. This, in turn, stretches out the stomach at the diaphragm creating our hiatal hernia. Following the directions on the box, I boiled the noodles nine minutes and placed them in a bowel. 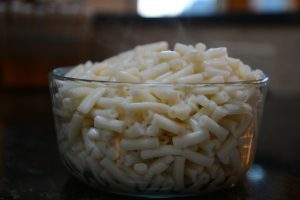 I then placed the noodles back in the hot water for an additional ten minutes and re-measured their content in the same bowel; you can see the significant swelling that occurred. This same process occurs in your stomach. You can now understand why you feel full for quite awhile after you have eaten your second helping of pasta or your third piece of pizza. Those wheat products begin to double or triple in size before they are broken down into a mush mixture. Fortunately, this country is beginning to return to wheat that existed before we went to GMO wheat. Several smaller farms in several states are returning to “Old World” grains. These do not contain the large amount of the amylopectin we have been consuming for the past 70+ years. Once the pizza parlors and pasta houses return to this non-GMO wheat, we will all benefit from this less expanding product. In the interim, remember that a plate of pasta becomes two; two pieces of pizza becomes four in your stomach and begins to help you create a hiatal hernia. Consume with caution. This entry was posted in Carbohydrates, Gastroesophageal Reflux, Hiatal Hernia, Nutrition by Dr. Michael F. Lyons. Bookmark the permalink.